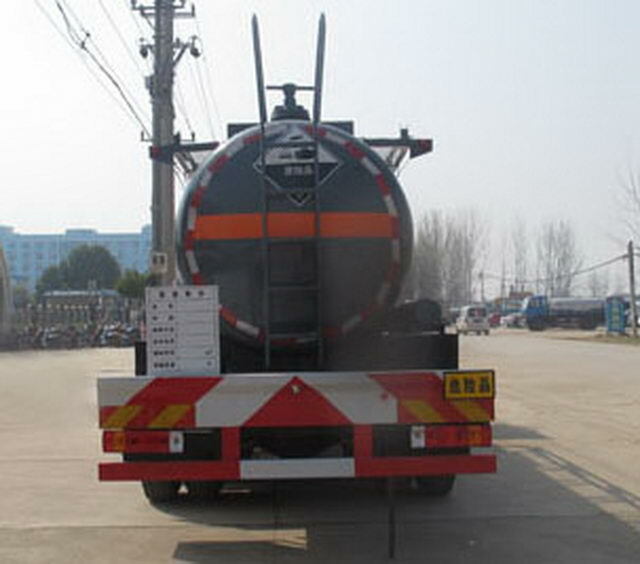 The vehicle is suitable for transporting dangerous liquid ,transport medium name:Hypochlorite solution,Hydrogen acid,sulphuric acid,Density respectively:1050Kg/Cubic metre,1047Kg/Cubic metre,1045Kg/Cubic metre;Item No. :8;Effective volume of tank:12.5Cubic metre; Vehicle length/Wheelbase/The front suspension/Rear overhang/Tank size(Length * diameter)(mm)Corresponding relation is:10160/4800+1350/1460/2550/7200* Phi1700(Straight line segment length6700);9660/4300+1350/1460/2550/6800* Phi1750(Straight line segment length6300). Protective material:Q235Acarbon steel,Connection mode:The left and right side and rear protection are welded connection,Rear protective section ruler(mm):120*50, Rear protection height(mm):510. Use only chassis11.00R20 16PRRadial tires and beltsABSChassis.,The front wheel of the vehicle is fitted with a disc brake,Front exhaust pipe,Assembling speed limiting device,Speed limit79km/h. Vehicle traveling data recorder with satellite positioning function. 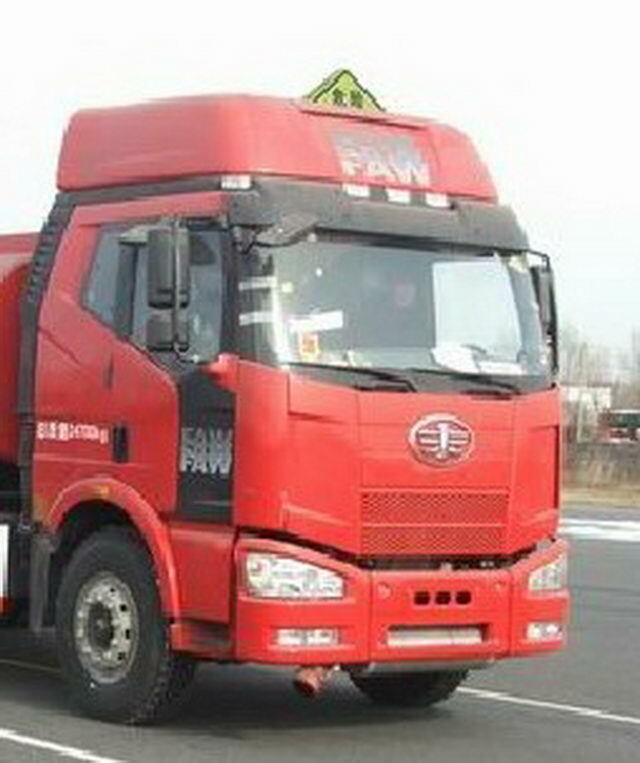 Chassis with optional high roof cab. 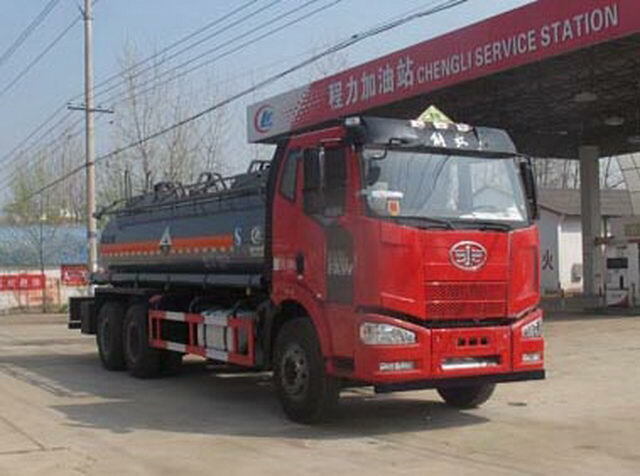 Corresponding relation of oil consumption(L/100km):36.33(CA6DK1-28E5),37.24(CA6DK1-26E5)ABSSystem manufacturer:Zhejiang Wanan Polytron Technologies Inc,Model:VIE ABS-Ii.